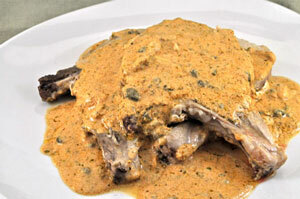 Thyme for Cooking's Main Courses: Salmon Risotto, Lamb Chops, Lasagne. 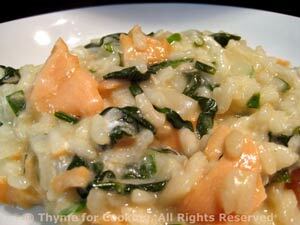 The smoked salmon lends a dinner party note to this risotto; the melted goat cheese makes it incredibly creamy. Heat chicken stock, tarragon and chives in medium saucepan. Keep hot over low heat. 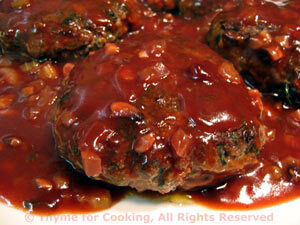 In medium sauce pan heat oil; add onion and sauté 5 minutes, until starting to get tender. When stock is almost absorbed add another 1/3 cup and continue adding 1/3 cup at a time and stirring. Before the last 1/4 cup is added taste a few kernels of rice. They should be just 'al dente' - slightly resistant to the tooth but fully cooked. If more stock is needed add it 1/8 cup at a time and waiting until almost completely absorbed. At this point risotto will be thick but not stiff - it will not hold it's shape on a plate. Add the Condimenti, Parmesan and stir well. Put fresh salmon into a small skillet. 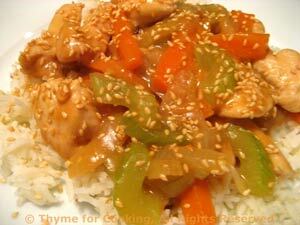 Add 1/2 cup of water, cover and simmer over low heat until done, about 10 minutes. Remove salmon, pour off water and cut into chunks. Slice smoked salmon into strips. Slice spinach into thick strips. 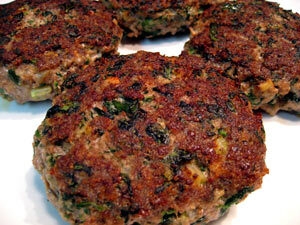 Vigorously stir in the goat cheese and spinach, and heat through. Add the salmon, smoked salmon and Parmesan, stirring well to combine. Heat 1 tsp oil in medium saucepan. Add shallot, carrot, garlic and sauté 5 minutes. Add tomatoes and sauté 5 minutes longer. Add sage, beans and white wine. heat and simmer, stirring occasionally, 15 minutes or until carrots are tender. 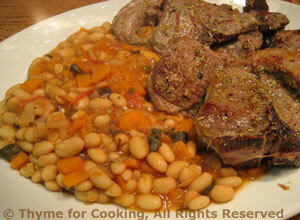 Spoon onto a small platter, add lamb chops and serve. Sprinkle rosemary and garlic powder on lamb chops. Heat 1 tbs oil in large nonstick skillet over medium high heat. Add chops and sauté 2 - 5 minutes per side, depending on thickness of chop and desired doneness. Make a slit and peak if not certain. Remove, place on platter with beans and serve. 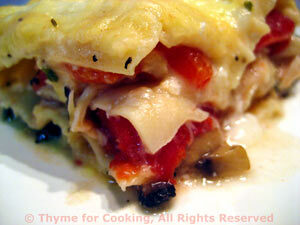 A layer of sautéed mushrooms, a layer of crushed tomatoes and one of shredded chicken and sliced red peppers makes this is a colorful lasagne with surprise flavors in each bite. Put the chicken breast and stock or water in a small skillet. Cover and cook over medium heat until done, about 10 minutes. 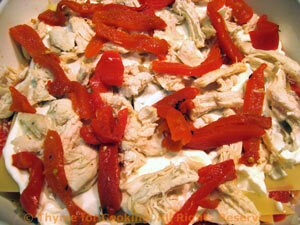 Remove and cut into thin slices or shred. Clean mushrooms and roughly chop. Heat oil in medium skillet. 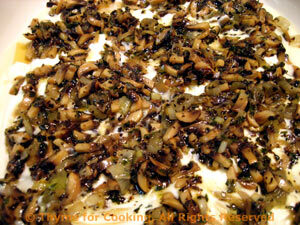 Add mushrooms, shallots and sauté until tender, about 15 minutes. Add 2 tbs of the water or chicken poaching liquid to get up the browned bits on the bottom of the skillet. Slice roasted red peppers into strips.